A leading senior buyer at Matsuya Ginza, Shunichi Miyazaki has been involved in the starting point of manufacturing for many years. In this interview, he speaks about his total commitment to suit making and the value of a suit. 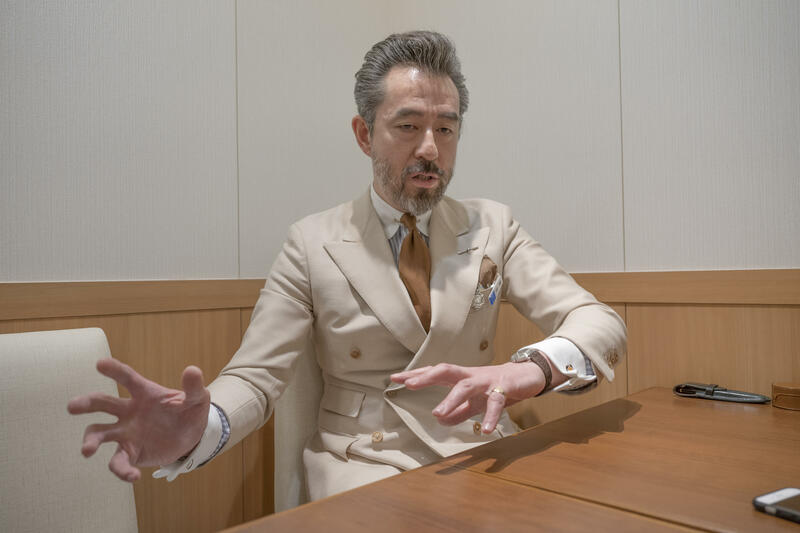 The commitment to suit making through total involvement in the entire processAs a menswear buyer at Matsuya Ginza, I have taken the lead in suit making as well as fabric buying while selling suits in the store. In suit making, I am involved in the entire process from beginning to end, including the procurement of thread and fabrics, design, cost calculation, the search for sewing plants, and the provision of technical assistance. This can reduce costs, enabling us to further pursue quality excellence. I don't think there are many buyers who commit themselves to as many aspects as I do. 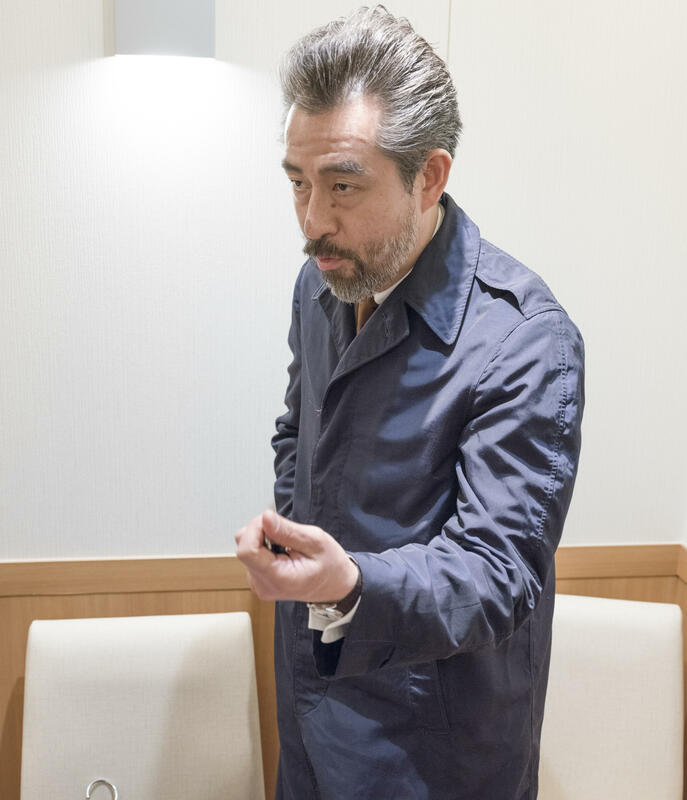 I have taken this approach for more than 20 years because in the department store industry, where the competitors tend to carry similar products, I want to achieve something that only Matsuya Ginza can do by getting involved in the starting point of manufacturing. What inspires me is a collection of vintage garments that I have amassed from all over the country and the world over the course of many years - which now includes more than 80 coats alone. By looking at the garments from each era, you can tell that the menswear of the 1930s had a significant influence on the style in the later periods; what appear to be totally different designs, such as suits with large collars and flared trousers, are actually reinterpretations of the 1930s. As a result, how much you know about the history is very important in suit making. When I look at an old, yet well-tailored suit, I have mixed feelings of respect and jealousy towards it, and I feel that I cannot afford to admit defeat. I also want to make a garment that will be handed down for posterity and treasured for many years to come. I definitely cannot afford to cut corners in suit making, as I want to ensure that my suits can be presented with confidence as vintage garments 50 years from now. Made-to-measure began amidst confusion Recently, demand for made-to-measure clothing has been increasing rapidly. At Matsuya Ginza, we have offered a made-to-measure service with original pattern since 2011. Our made-to-measure service began out of necessity at first: we received an inquiry from a factory in Nagasaki asking whether it could enter into a contract with us for making made-to-measure clothing. They showed us their sample suit, which had obviously been made from an absurdly old pattern. When I looked closely, however, the suit was really well- with neat padding, well-sewn sleeves, and a lapel turned up in a good shape. Matsuya Ginza did not yet offer our original made-to-measure garments at that time, but I became interested in its excellent make. I visited the factory in Nagasaki to hold a discussion and promised to place orders for the autumn fair that was scheduled to be held six months later. Immediately after I returned to Tokyo, the Great East Japan Earthquake occurred. The Ministry of the Environment launched the "Super Cool Biz" campaign in light of the need to save energy. During an office meeting that was held in the midst of confusion, filled with arguments and complaints about how we could respond to this as a department store and whether we had enough time for it, I could not stop thinking about the factory. By persuading my boss that the factory might be able to help us out of this situation, I returned to Nagasaki, where I immediately requested that the factory keep materials for us, including thin pads, light canvas, and the Bemberg fabric for linings. By combining these materials and eliminating as many secondary materials as possible, we launched a made-to-measure midsummer suit designed for "Super Cool Biz". The suit was featured in the media every day. At the "OTOKO-ICHI" (Men's Fair event) in May, the results far exceeded our expectations with 600 orders received in two weeks. I learned later that the factory was on the verge of bankruptcy at the time, but this event helped it to recover. We have placed made-to-measure orders with them ever since. I still visit the factory in Nagasaki four or five times a year and continue to maintain a relationship with them so that we can pursue the comfort of suits together. Comfort-focused, high-quality products offered as standard In Matsuya's original made-to-measure service, Bemberg fabric is used for linings as a standard specification. The lining is very important for creating a comfortable suit. However, many customers are not aware of this; they have no information at all on the lining, such as whether there is a static-free lining fabric or what the difference is between polyester and Bemberg. Other stores probably provide little explanation on the importance of the lining because they charge extra for a Bemberg lining instead of a polyester one, which is usually used as standard. When I tell customers that even if they choose the finest fabric for the outer surface but use polyester for the lining, their skin will be touching the same material as a plastic bottle, their eyes widen in surprise. I believe that it is also our mission to inform customers that the lining, although invisible from outside, deserves even more special attention than the outer surface fabric does, and I make sure to always provide this information to customers. In our suit making, we also focus on patterns, full canvas interlining, the press process, and so on to seek the greatest comfort. Our customers say that they used to take their jacket off in the office, but now they always keep it on. Buttons are also an easily overlooked aspect because they comprise only a very small part of a garment. They are, in fact, a very important part that can influence the impression of a garment as much as women's eye makeup does. We therefore offer premium buttons made of nut, water buffalo horn, and natural mother of pearl from which customers can select as a standard feature. The beauty of buttonholes is a further aspect that we take seriously. We, of course, keep the price down as much as possible, but the joy of made-to-measure suits lies in the fact that you can select high-quality linings and buttons made from natural materials without any additional charges. I think that allowing customers to fully enjoy this experience is one of the values that a department store should offer. Determination to introduce potential customers to the value and how to enjoy a suitFall of 2017, we launched a new membership club called Matsuya Men's Club for people who work at some listed companies. The Club offers a membership service for one-on-one personal advice on fashion styling from head to toe, which is available only by advance reservation. 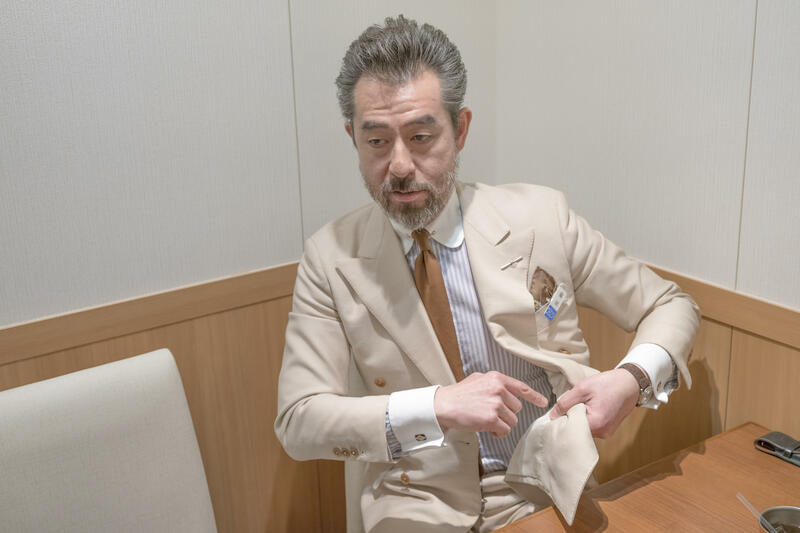 In Western cultures, it is said that men spend about one percent of their annual income on suits, while in Japan many high-income earners wear cheap suits. That is to say, Japanese men have found little value in suits. Because of the low price they pay for a suit, they take poor customer service and extremely long delivery times for granted. I would like to tell these people how much value an everyday suit can bring and how much positive influence a good suit has on their work. I would also like to provide the excitement that only a department store can create. In this service, therefore, we insist on the importance of a customer's visit to our store. You may be able to make a convenient purchase with a single click today, but this does not provide you with a feeling of excitement or elation. 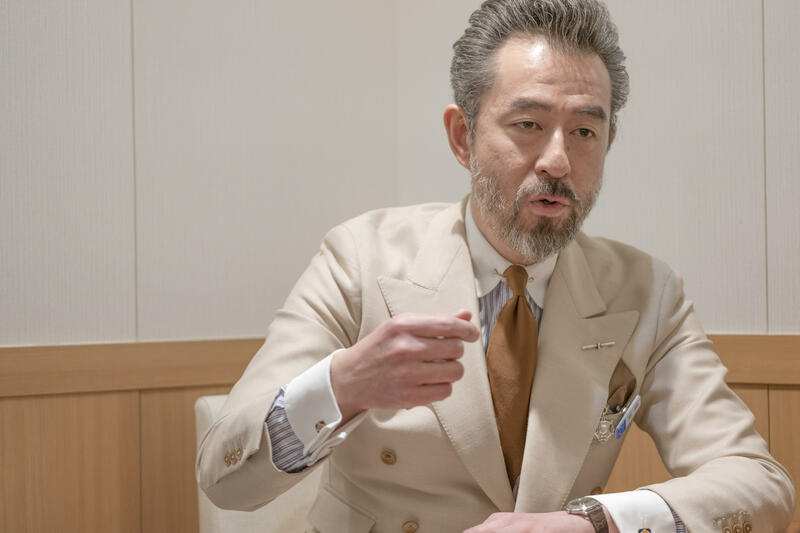 I would like our customers to feel motivated to go to Ginza just to order a suit and know that enjoying the time they spend in our lounge space is part of the value they receive. For that purpose, we have put all the necessary systems in place, including an extensive product lineup, a well-produced store ambience, and trained staff who can respond to any questions from customers in an easy-to-understand manner. We have some customers who were not interested in fashion at all, but who were forced to come to our store by their wives. After our service is concluded, they tell us that they did not expect that it would be so much fun. To them, suit making has been transformed from "pain" to "fun." I am happy to hear them say with a smile, "I really enjoyed it. I felt depressed thinking about what I would have to go through before I came here -- selecting linings and buttons. But the hour has passed so quickly." 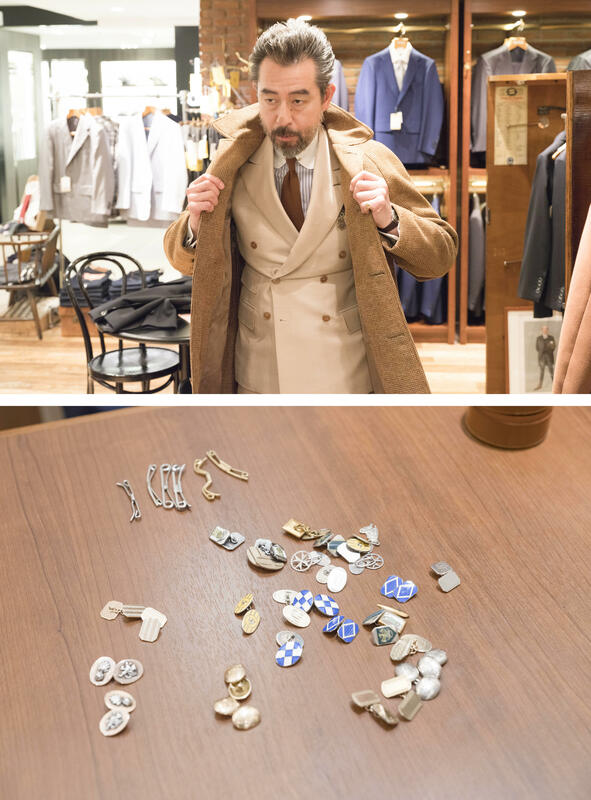 What we should pursue is not how much money we can make, but how well we can convey to customers the value of a suit and the joy of made-to-measure by providing advice according to a customer's needs. If you can do this, I believe that profit will follow. In the UK, it is said that doctors, lawyers and tailors are the most important advisors with whom you will have close relationships for generations. When a son grows up, his father takes him to his favorite tailor to have a suit made for him. This means that the customer trusts the tailor and can leave everything related to the suit to him due to the established relationship between them. I believe that we also must be like that. Born in Hokkaido in 1965. Joined Matsuya in 1989. He has been a menswear buyer since 1996. His work includes fabric buying in Europe and the establishment of Matsuya's original brand "atelier maid." He also serves as a lecturer in the fashion business at IFI Business School, Aoyama Gakuin University, Tokyo Metropolitan University, Tokyo Keizai University, and Yokohama City University. His books include A Successful Man's 60 Fashion Tips (Kodansha), among others.